It has been more than a year since the original LightWallet was released and since then NanoWallet has come a long way. 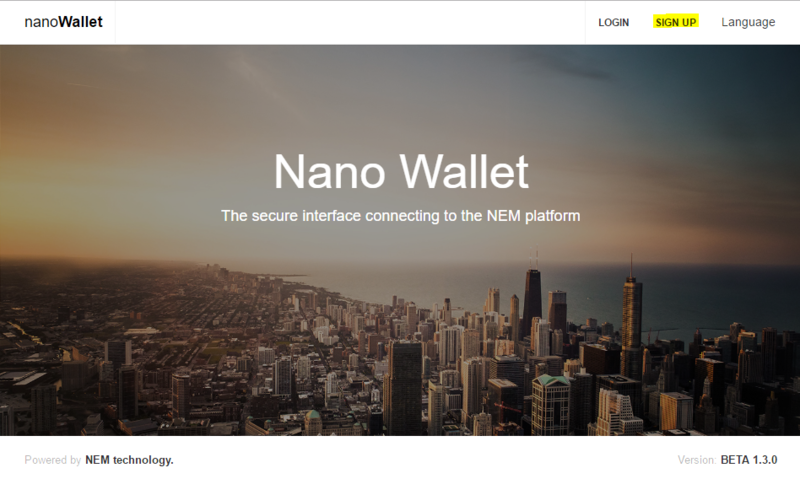 NanoWallet is taking over from NCC as the desktop wallet in NEM and will be the officially supported client. The newest version, Version 1.3.0, has seen a lot of improvements, so here is a tutorial to help everyone get caught up. Before you install NanoWallet, make sure you are using a computer which is clean (Antivirus-/Antimalware-Scans) and always use a strong, unique password (read more about it here). 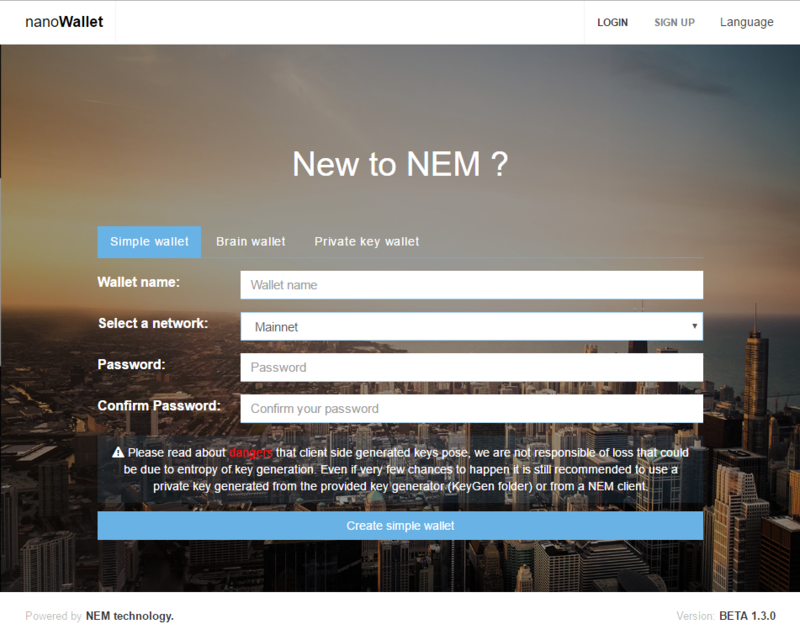 Download the NanoWallet from nem.io. Extract the zip file and double-click "start.html"
Do not use Microsoft Edge browser, it can result in the loss of your wallet. We recommend Google Chrome or Firefox. From the NanoWallet web interface, select "sign up." In this guide, we will create a simple wallet. If you want to learn about the different wallet types, it's covered later in this guide. For those wanting to know how to import your existing wallet from NCC, please visit the wallet import tutorial or watch this demo video. When you create a simple wallet, the NanoWallet will create a yourwallet.wlt file which contains your private key. The file is encrypted with your password. If you want to import the wallet to another computer, you need the .wlt file AND the password. When you create a brain wallet, the NanoWallet will create a private key which is derived directly from your password/passphrase. As the name suggests, a brainwallet is meant to be only secured by a password/passphrase which can be remembered without further backups. You can log into a brain wallet from any NanoWallet on any computer; a .wlt file is NOT needed, nor is the private key ever stored in the wallet file as it will be derived each time independently. Because of that reason, we recommend an extra long passphrase, e.g., at least 12 random words. A Private key wallet can only be created if you already have a private key for a previously created NEM address. It can be used to import an old account or paperwallet. Open the login page, select your wallet, enter the password and log in. When you log in for the first time, your browser downloads a backup of your wallet. More on backups later in this guide. You are now presented with the dashboard. 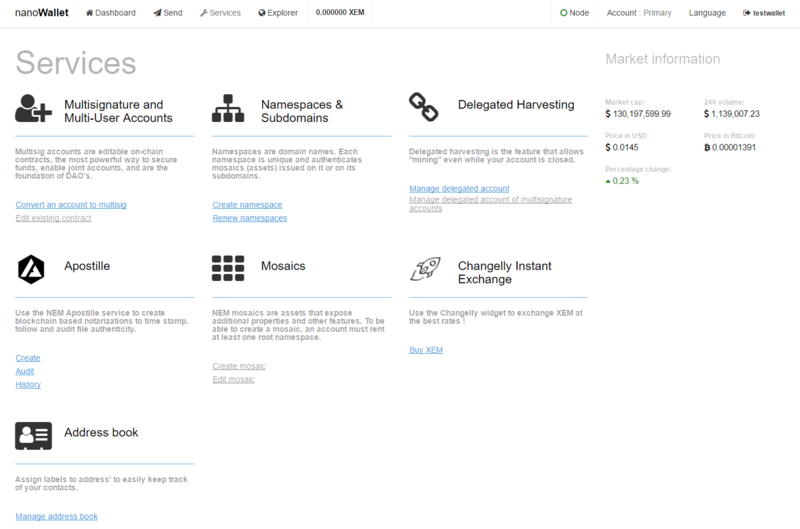 The dashboard shows some basic information about your account and harvesting income. There is also market information to keep track of the exchange rate. 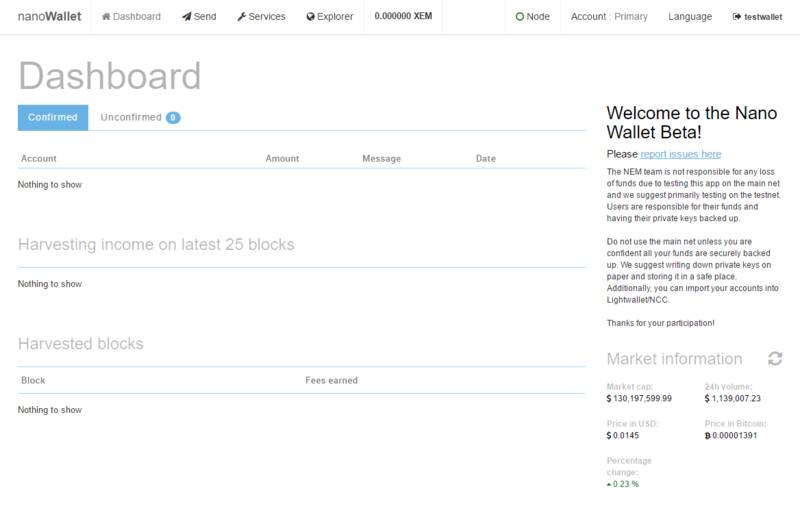 Open "Account" by clicking on it in the top right corner of the NanoWallet. 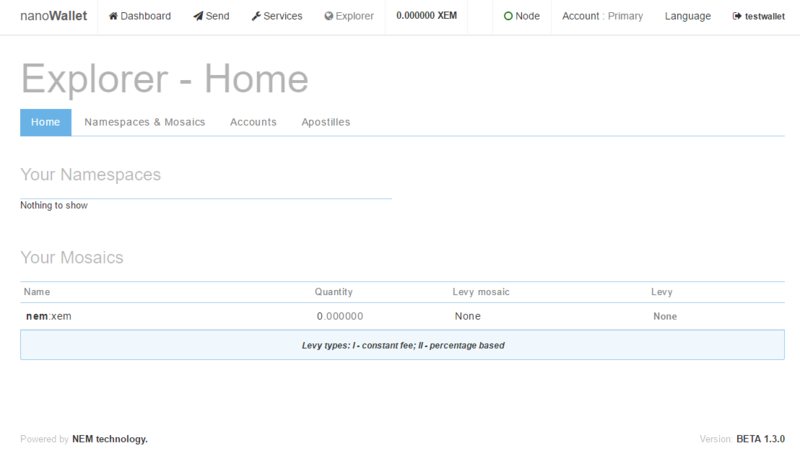 Account Information shows, for example, your NEM address for receiving funds and also your vested balance for harvesting. From here you can also create a backup of your wallet. We recommend backing up to a file AND to paper! If you didn't store the .wlt file on wallet creation, it can be downloaded later by clicking on "Account" in the top-right corner of the wallet and select "Backup wallet." Watch a demo guide here. Store your wallet file on different drives, for example, USB thumb drives, USB hard drives, and network storage. We recommend encrypting the file with a tool like TrueCrypt or 7-zip before storing it on a different drive. Reminder: Without your password your wallet file is useless! Enter your password on the "Private key" section on the account page and press "+". When you entered the password, it shows your private key. You can now either write this information on a paper or take a screenshot to print it out. Store it in a safe place. Reminder: With the private key you can control the account. No password is required! From the Send & Receive tab you can create transactions and invoices. 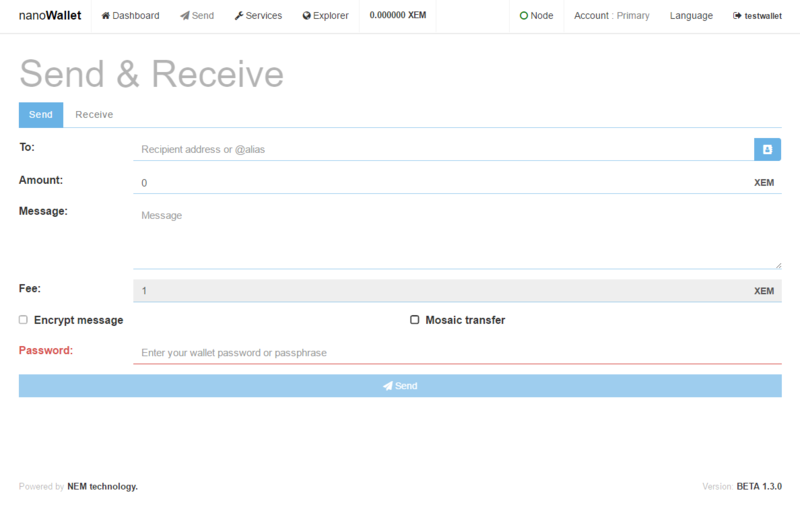 You can also create transactions with messages, encrypted messages and/or mosaics. You can read more about mosaics later in this guide. Watch a demo example here. Learn about the different NanoWallet services. The more advanced and most secure way of securing your funds is multi-signature. NEM's current implementation of multisig is "M-of-N", meaning M can be any number equal to or less than N, i.e., 1-of-4, 2-of-3, 4-of-9, 11-of-12 and so on. 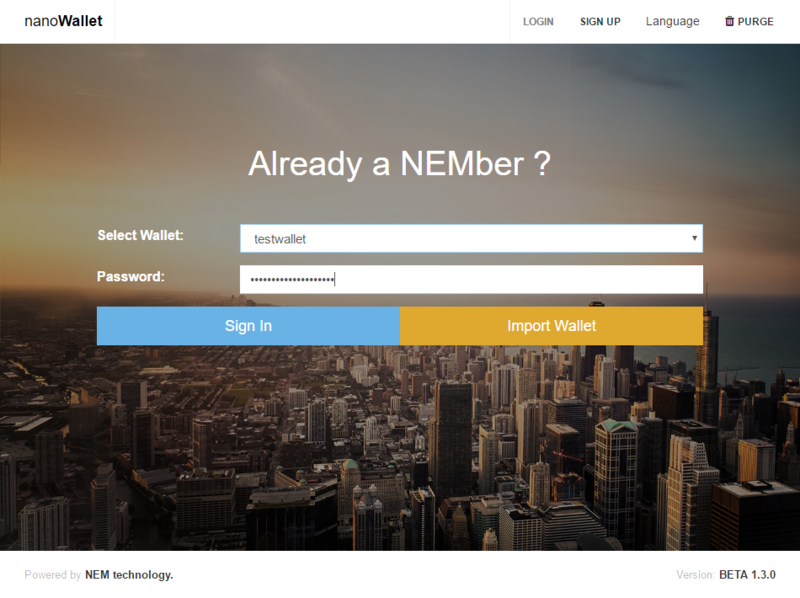 NEM also allows "N-of-N" accounts, i.e., 1-of-1, 2-of-2, 5-of-5, 10-of-10 and so on. NEM's multisig is supported by all NEM wallets including NCC, Android, iOS, Nano, and NEMpay. Multisig accounts are as easy to set up as a few clicks and even have push notifications sent to your mobile or desktop wallet notifying you to sign. If you are interested in multi-signature accounts, you can read more about it here. And you can watch a series of demo videos here. On the NEM blockchain, it is possible to create namespaces & subdomains. In short: Namespaces are domain names. Each namespace is unique and authenticates mosaics (assets) issued on it or on its subdomains. Read more. Namespaces can furthermore be used for things like “send by name” so once a person has registered a namespace, their @namespace can be entered into the account address blank when sending a transaction and the matching account number that registered it will be automatically retrieved. You can create and renew your namespaces from inside the NanoWallet. Go to Services, then Create Namespace, and choose a new root namespace you would like to register. 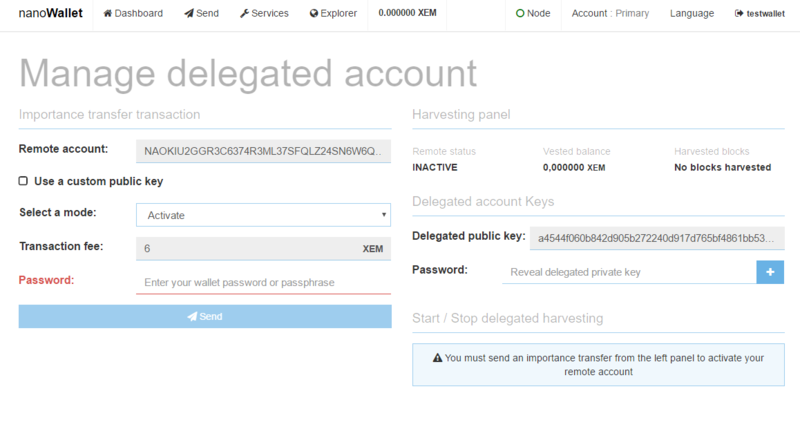 To activate delegated harvesting, you need a minimum vested balance of 10'000 XEM. If that is the case, you can activate it from this menu. You can leave all settings to default, input your password and activate it by pressing send. After activation, you need to wait 6 hours until it becomes active. After 6 hours have passed, you can start harvesting from the bottom right. A video guide for setting up harvesting can be found here. And another demonstration video to start the actual harvesting is found here. And to read more about harvesting, go here. Apostille is an advanced notarization system built on NEM. You can notarize a file, add memos to it, update to the new version of the document, and even transfer ownership of the notarization to another person. More about Apostille is covered in a separate post. Read about it here. An example video demonstrating Apostille and verifying a notarized copy of NanoWallet can be found here. NEM mosaics are assets that have additional properties and other features. To be able to create a mosaic, an account must rent at least one root namespace. Read more about it here. 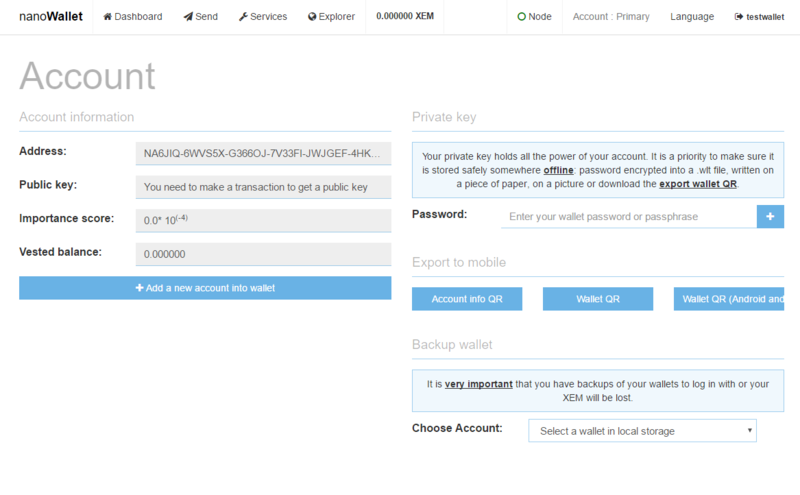 Changelly allows you to buy XEM from inside the NanoWallet. 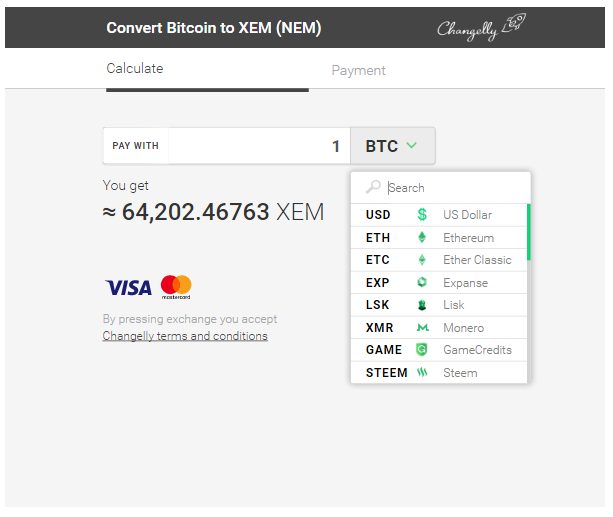 Choose your preferred currency to get XEM. Just a simple address book. Open the explorer to see your owned mosaics, search for Namespaces & Mosaics and more. The NEM team would like to thank Patrick for contributing this tutorial.